From 2015-2017, I have carried out an artistic research project on the use of live video in music theatre. This project has been part of the work of the Professorship Performative Processes at HKU University of the Arts Utrecht. This research investigates the use of live video in music theatre, and aims to develop a distinct position from the perspective of experimental music theatre. Within the extensive possibilities of combining video and music, the focus of this project is to achieve extra-musical or theatrical potential, and to create narrative-associative layers by means of live visual processing of musical actions. It aims to develop an approach to using live video in music theatrical settings with a specific perspective on the relation between input and output of the video: Instrumental actions, the instrument itself and objects are filmed by cameras. This input is processed in dedicated software (programmed in MaxMSP/Jitter). The processed video will then act as an additional layer different from what can already be visually experienced in the live music on stage. 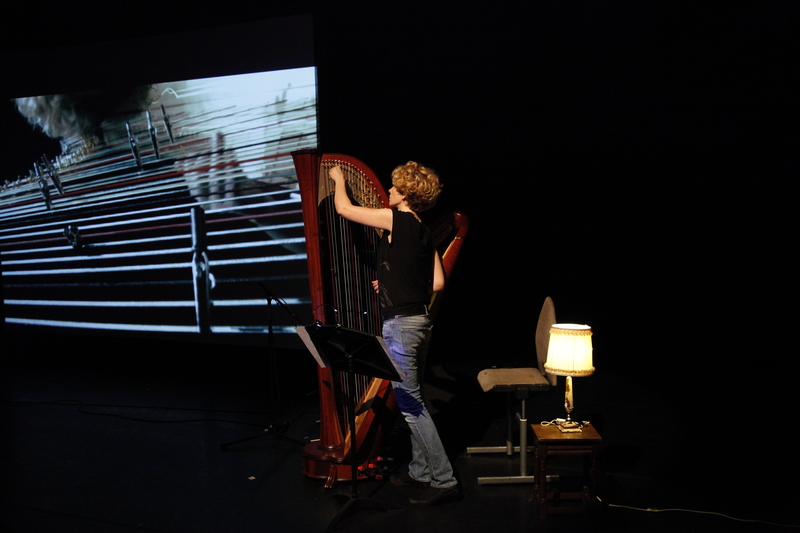 Filmed parts of the instruments or preparations attached to the instruments can become theatrical objects in the live visuals (such as braces on strings could become abstract figures or human-like characters). Various techniques of video processing can be applied and researched, such as temporal displacements, tempo changes, visual effects (such as blurring, distortion, colour filters) or multiple image layerings. Different narratives than the live musical actions become possible, in which the processed movements in the video can “tell a story” of their own, different from what the live actions communicate. Scene of the staged composition Living Room (2011). Part of the video was a little attempt to try out the idea of [this project], using braces on the harp, projected as horizontal “space”, as members of a “population”, inspired by photographs of Jeff Wall in which people are waiting for their bus to work. Still of the video part of “Living Room”. Artistic creation is seen as the central part and most essential activity of the project, in which the software programming is regarded as an integral artistic and aesthetic element. This artistic practice is both method and outcome of the project. Next to creating artistic work, existing elaborations of live video in musical performance will be studied and analyzed, such as the challenging work of German composer Michael Beil. Next to this kind of work, related artistic areas such as object theatre (e.g. Dutch company Hotel Modern) and intermedial theatre (e.g. work by Belgian director Guy Cassiers), both with extensive use of live video, will be examined. As these examples all come from either contemporary composed music or theatre, the project I frame here adds the perspective of music theatre, which is not yet developed in comparable specificity and diversity. Additionally, theoretical implications (intermediality in performance, performativity of musicians and musical instruments) are considered, both through study of literature and own writing (articles and websites). Thus, the final outputs of the project will be both artistic and in written form. The artistic outcome of this research is a first, preliminary version of a performance installation for prepared double bass, live electronics and live video, which I perform myself. The double bass (strings) is prepared with a variety of objects, provoking alternative sounds of the bowed and plucked strings on the one hand, and providing input for the live visuals. The work experiments with the theatrical meaning-making potential of the visual approach. Sketch of the structure of the devised performance. After these initial session, I joined forces with the young theatre and media scholar Juriaan Achthoven from Utrecht University. We worked together, co-creatively until the final presentation of the project as part of his internship during his master studies. Juriaan’s questions in this endeavour were: How does Hübner shift between these modes of creation [creating both artistically and discursively]? How does theory and writing nourish this practice? In our sessions we experimented with a radicalisation of this feedback loop between practice and theory, transforming the project into a situation of a fluent workshop in which practice, documentation, reading and complementary writing (also concepts from Nelson) freely alternate and merge. As Juriaan observed correctly, we have performed a switch concerning our attention and focus, from the artistic research question to a methodological question about our artistic research – all while doing it. Finally, we made a performance in four parts (see sketch of the structure above), in which each of the four parts exemplifies a different use of the camera in relation to the objects and utterances. We presented these practical outcomes in a lecture performance at the Conservatoire in Utrecht, The Netherlands, in June 2017 (click here for the slides of the presentation). Building the “icy” sculpture for the first part of the performance.